The Energy East pipeline project will carry diluted bitumen through the Ottawa River Watershed. Will your drinking water supply be protected from spills? Stand up for your river and get involved. TransCanada Corporation recently announced its Energy East pipeline project. It involves converting 3,000 km of existing natural gas pipeline to transport crude oil, and building over 1,400 km of new pipeline, making it the longest in North America, crossing six Canadian provinces from Alberta to New Brunswick. The pipeline will have the capacity to transport 1.1 million barrels per day of crude oil through the Ottawa River Watershed. This high-pressure pipeline may pass through streams and rivers in your community and will ultimately cross the Ottawa River, upstream of Montreal where over 1 million people drink water from the Ottawa River. My immediate reaction is concern for spills – the news is filled with reports of oil spills into groundwater, lakes, rivers and oceans. Recent investigations have found that many pipeline spills go unreported. Given the complexity of the overlapping jurisdictions along the Ottawa River I am not confident there would be an efficient and well-coordinated response in the event of a spill into our interprovincial river. And it is important to remember that spills and leaks are not the only environmental ramifications of the Energy East project. The Pembina Institute published an overview of its climate considerations vis-à-vis the TransCanada Energy East Project. In short, they showed that the crude oil required to fillthis pipeline would significantly increase Canada’s greenhouse gas emissions, making it difficult to meet our national climate targets. As many of you are well aware, climate change poses very significant risks to the health of our river and the species within it. The environmental effects of a spill depend, among other things, on the vulnerability of the region, its characteristics and the speed and ease of response. Even a small spill in the wrong place can have a significant environmental impact. Ottawa Riverkeeper has several concerns about Energy East. The pipeline that will be converted is 55 years old and was designed to transport natural gas, not crude oil. We are concerned about the integrity of the converted pipeline and the safety of transporting oil at high pressure in an aging pipeline not designed for this substance. 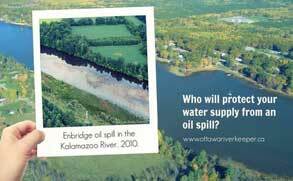 A disastrous pipeline spill in Kalamazoo, Michigan in 2010, spilled more than 3.8 million litres of diluted oil-sands bitumen, contaminating a 48-km stretch of the Kalamazoo River which is still contaminated, even after “clean-up” of the spill. A pipeline rupture in the Ottawa River watershed could pollute drinking water supplies for communities like North Bay, Ottawa, Gatineau and Montrealwho get their drinking water from the Ottawa River and its tributaries. It could do irreversible damage to sensitive aquatic ecosystems and fish habitat. An additional concern: how effective would an emergency response be in the event of a pipeline rupture within our watershed? The Ottawa River is an inter-jurisdictional body of water and we can imagine how difficult it could be for the governments of Ontario, Quebec and Canada to co-ordinate a sufficiently speedy and successful clean-up effort in the event of a spill. Jurisdictional challenges aside, our river is ice-covered 4-6 months of the year. A spill into the Ottawa River in January would be devastating as it would be extremely challenging to stop and clean-up. The threat of spills is likely the number one concern for most Canadians; however, building 1400 km of new pipeline could also have significant impacts on our fisheries. Every stream crossing must be designed and constructed to minimize impacts on hundreds of streams and rivers the proposed pipeline will cross. Ottawa Riverkeeper is troubled to learn that the Department of Fisheries and Oceans is no longer responsible for protecting our fisheries from pipeline projects. A memorandum of understanding was signed on December 16, 2013 and now the National Energy Board (NEB) will be responsible for assessing the potential impacts to fisheries from proposed NEB regulated pipeline applications. Isn’t that kind of like leaving the fox to guard the henhouse? The federal government is ultimately responsible for approving the Energy East Pipeline; however the National Energy Board is responsible for gathering evidence, consulting with Canadians and preparing a recommendation to the federal government. They must answer the challenging question: is this project in the public’s best interest? The consultation process involves NEB hearingsstarting in 2014 – TransCanada is expected to file its regulatory application with the NEB in the first half of 2014. Recent changes to NEB rules make public participation in the hearings very difficult; only those with relevant information or expertise may be granted the opportunity to participate (if they apply). As such, Ottawa Riverkeeper intends to apply for this status. In addition, the Ontario government will apply for intervener status at the NEBhearings. Ottawa Riverkeeper is participating in the Province-wide stakeholder group consultations the Ontario Energy Board (OEB) is holding to gather input to the proposed Energy East project. The final decision as to whether or not this project goes ahead will be made by the federal government and based on the recommendation of the NEB after the hearings take place. If you want to be heard concerning the proposed Energy East project, keep an eye out for the OEB public consultations in your area. Other organizations are organizing community tours in Ontario and circulating petitions if you are moved to take action now. We will provide you with updates in future newsletters and on our website as this project progresses.